by Chris Woodford. Last updated: August 31, 2018. If our eyes could detect super-energetic forms of radiation such as X rays, looking at our friends would be an altogether more surreal experience: we'd be able to see straight through their skin and watch their bones jiggling about underneath! Perhaps it's fortunate that we don't have that kind of ability—but we can still enjoy the benefits of using X rays all the same: they're hugely important in medicine, scientific research, astronomy, and industry. 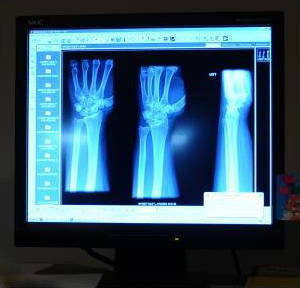 Let's take a closer look at what X rays are, how they work, and how we make them! Photo: Once X rays had to be treated like old-fashioned photographs. Now, they're as easy to study and store as digital photographs on computer screens. Photo by Kasey Zickmund courtesy of U.S. Air Force. Imagine you had the job of redesigning light to make it a bit more powerful—so you could see through bodies, buildings, and anything else you fancied. You might come up with something a bit like X rays. X rays are a kind of super-powerful version of ordinary light: a higher-energy form of electromagnetic radiation that travel at the speed of light in straight lines (just like light waves do). If you could pin X rays down on a piece of paper and measure them, you'd find their wavelength (the distance between one wave crest and the next) was thousands of times shorter than that of ordinary light. That means their frequency (how often they wiggle about) is correspondingly greater. And, because the energy of electromagnetic waves is directly related to their frequency, X rays are much more energetic and penetrating than light waves as well. So here's the most important thing you need to remember: X rays can travel through things that ordinary light waves can't because they're much more energetic. 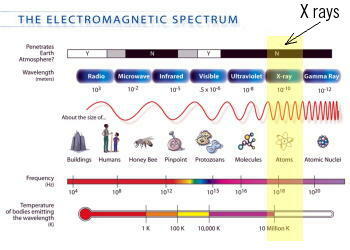 Artwork: The electromagnetic spectrum, with the X-ray band highlighted in yellow over toward the right. You can see that X rays have shorter wavelengths, higher frequencies, and higher energy than most other types of electromagnetic radiation, and don't penetrate Earth's atmosphere. Their wavelengths are around the same scale as atomic sizes. Artwork courtesy of NASA (please follow this link for a bigger and clearer version of this image). We all know that some materials (such as glass and plastic) let light pass through them very easily while other materials (such as wood and metal) don't. In much the same way, there are materials that allow X rays to pass straight through them—and materials that stop X rays dead in their tracks. Why is this? When X rays enter a material, they have to fight their way through a huge scrum of atoms if they're going to emerge from the other side. What really gets in their way is the electrons whizzing round those atoms. The more electrons there are, the more chance they have of absorbing the X rays and the less likely the X rays are to emerge from the material. X rays will tend to pass through materials made from lighter atoms with relatively few electrons (such as skin, built from carbon-based molecules), but they're stopped in their tracks by heavier atoms with lots of electrons. Lead, a heavy metal with 82 electrons spinning round each of its atoms, is particularly good at stopping X rays. (That's why X-ray technicians in hospitals wear lead aprons and stand behind lead screens.) The fact that some materials let X rays travel through them better than others turns out to be very useful indeed. What are X rays used for? From studying tooth decay in your mouth to detecting events in distant galaxies, X rays are useful in many different ways. 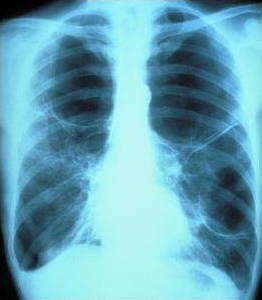 Photo: A typical chest X ray. This one (apparently) shows emphysema bubbles in the patient's left lung, which are severely affecting breathing. Photo courtesy of National Heart, Lung and Blood Institute (NHLBI) and National Institutes of Health. One of the first uses people found for X rays was in medicine—and they're still best known as a medical tool, used in both diagnosis and treatment. Hard materials such as bones and teeth are very good at absorbing X rays, whereas soft tissues like skin and muscle allow the rays to pass straight through. That makes X-ray photographs (which look like shadows of the things inside your body) extremely useful for all kinds of medical diagnosis: they show up broken bones, tumors, and lung conditions such as tuberculosis and emphysema. Dentists also use X rays extensively to help them understand what's happening in parts of your mouth—inside your teeth and gums—that they could not otherwise see. There's a limit to what a physician can understand from a two-dimensional photograph of your three-dimensional body, especially with so much packed inside such a small space, but 3D-scanning technology helps to overcome that. CT or CAT (computerized axial tomography) scanners draw what are effectively 3D, X-ray pictures on screens by firing pencil-thin beams of X rays through a patient's body and using computer technology to turn lots of 2D pictures into a single 3D image. Since X rays are highly energetic, they can damage living tissue when they pass through it. On one hand, this means X rays have to be used cautiously and quite selectively—and X-ray technicians (known as radiographers) have to take precautions about absorbing too much of the radiation during their work. But on the other hand, X rays can also be used to sterilize medical equipment (because they destroy germs) and kill tumors in the treatment of cancer. This is known as X-ray therapy (also called radiation therapy and radiotherapy). X ray scans that show up the organs lurking inside your body are just as useful for checking bags at airport check-ins: X rays pass straight through soft materials such as leather and plastic but are blocked by the metal in guns, knives, and weapons. Typically suitcases and bags travel up through large scanners on conveyor belts, with X ray images of their contents appearing instantly on computer screens studied by security guards. CT scans are increasingly being used in airport scanners to measure the density of liquids being carried in luggage; this has proved to be a quick and effective way of detecting some kinds of explosives. Scanners such as this are called CTX machines and are made by companies such as GE InVision. Photo: Nondestructive X ray testing is one way to inspect planes without taking them apart. 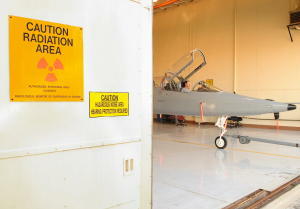 Here, a plane has just been tested in a lead-lined hangar at Randolph US Air Force Base, Texas. The warning signs you can see on the door indicate the potential dangers from the X rays. Photo by Steve Thurow courtesy of US Air Force. If you can use X rays to study lung problems or scan airport baggage, why not use it in a similar way to detect faults lurking inside machines? That's the theory behind nondestructive testing, where engineers X ray all kinds of industrial equipment to help them track down things like cracks and fatigue in metal components that might otherwise go undetected. Turbine blades in airplane jet engines are tested in this way to make sure they're not harboring any problems that would cause them to fail suddenly during flight. All kinds of other products are also routinely studied with X rays. Oil paintings, for example, are often X rayed to prove their authenticity (occasionally showing up earlier versions of a picture or entirely different images by the same artist on the same canvas). Tiny, precise X-ray beams can also be used as microscopic machine tools. The miniature circuit patterns of integrated circuits (silicon chips) can now be drawn using immensely precise beams of X rays using a technique called X-ray lithography. Light beams were once used for this purpose; using X rays, which are thousands of times finer, allows components to be made smaller, which in turn makes for smaller and more powerful chips. 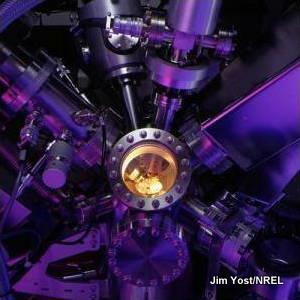 Photo: Studying semiconductor materials with X-ray spectroscopy. Photo by Jim Yost courtesy of US DOE/NREL. Apart from medicine, the other original use for X rays was in studying the inner structure of materials. If you fire a beam of X rays at a crystal, the atoms scatter the beam in a very precise way, casting a kind of shadow of the crystal's interior pattern from which you can measure the distance between one atom and its neighbors. This is called X-ray diffraction or X-ray crystallography, and, thanks to British scientist Rosalind Franklin, it played a hugely important part in the discovery of DNA's structure in the 1950s. 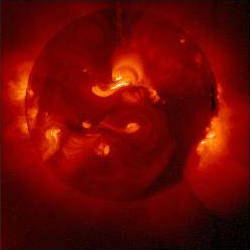 Photo: X-ray image of the Sun produced by the Soft X-ray Telescope (SXT). Photo courtesy of NASA Goddard Space Flight Center (NASA-GSFC). We're used to the idea of looking through telescopes to see light from distant objects—even ones far out into space. But not all telescopes work this way. Radio telescopes, for example, are more like giant satellite-dish antennas that capture radio waves being given off from those distant sources. X rays also travel through space and we can study them in a similar way with telescopes tuned to recognize their particular frequency. Unfortunately for astronomers, but possibly fortunately for the benefit of our own health, Earth's atmosphere absorbs X rays coming from space before they reach our planet's surface. That means we have to study sources of X rays with telescopes located in space instead of ones based here on Earth. How are X rays produced? If you've read our main article on light, you'll understand that you see things when they reflect light rays. More specifically, reflection happens when the electrons in atoms inside objects move position to absorb and then re-emit light energy. If you want to make red light, you can shine a flashlight on a tomato so the red part of the original white light in your flashlight beam is reflected back. X rays are produced in a more energetic version of the same process. If you want to make X rays, you simply fire a beam of really high-energy electrons (accelerated using a high-voltage electricity supply) at a piece of metal (typically tungsten). What gets reflected back, in this case, is neither light nor electrons but a beam of X rays. Generally speaking, the higher the voltage you use, the faster the electrons go, the more energetically they crash into the tungsten, and the higher the energy (and frequency) of the X rays they produce. How were X rays discovered? 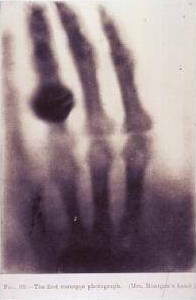 Photo: Wilhelm Röntgen's X-ray photograph of his wife's hand. Note the rings! Photo believed to be in the public domain, courtesy of the National Library of Medicine's Images from the History of Medicine (NLM) collection and the National Institutes of Health. 1895: German physicist Wilhelm Röntgen (1845–1923) discovers X rays while experimenting with cathode rays (the name then given to electron beams) in a glass tube. The X rays leak through the glass and into a nearby cardboard box, where they make paper coated with a fluorescent material glow. Röntgen doesn't know what these rays are so he calls them "X rays" (X being the name typically given to unknown quantities in mathematical problems). This discovery earns him the very first Nobel Prize in Physics in 1901. 1896: Inspired by this discovery, prolific American inventor Thomas Edison (1847–1931) develops an X-ray viewer called a fluoroscope. 1906: Charles Barkla (1877–1944), a British physicist, shows that X rays can be polarized in a similar way to beams of light. This provides important evidence that X rays are essentially like light waves only of different wavelength and frequency. 1912: German physicist Max von Laue (1879–1960) discovers he can measure the wavelength of X rays by firing them through crystals, roughly confirming the wavelength of X rays and the regular atomic nature of crystals. 1913-1914: British physicist William Henry Bragg (1862–1942) and his son (William) Lawrence Bragg (1890–1971) effectively reverse this experiment, showing how X rays of known wavelength can be used to measure the atomic spacing of crystals—and developing the field of X-ray crystallography. For this, they earn the 1915 Nobel Prize in Physics. 1913: American physicist William David Coolidge (1873–1975) develops the practical X-ray-making machine. Known as a Coolidge tube, it's a long glass jar with an electron beam and a metal target inside. When the beam is fired at the target, X rays are produced. Increasing the voltage produces faster and more energetic X rays with higher frequencies and shorter wavelengths. Coolidge patents his invention in 1916. Most X-ray machines still work broadly this way today. 1922: Arthur H. Compton (1892–1962), another American physicist, studies the reflection of X rays from highly polished glass and measures their wavelength very precisely. He discovers the phenomenon now called the Compton effect (or Compton scattering): the scattered X rays have less energy than the particles in the original beam, providing evidence for the particle-nature of electromagnetic radiation. 1953: Francis Crick (1916–2004) and James D. Watson (1928–) work out the structure of DNA with help from X-ray diffraction images produced by Rosalind Franklin (1920–1958). 1972: British electronics engineer Godfrey Hounsfield (1919–2004) invents the CT scanner, which makes 3D images of the inside of a person's body using thin X-ray beams. 1980s: Powerful X-ray lasers are proposed that would produce X rays through a process of stimulated emission (where atoms are made to emit radiation in a precise way by persistently "pumping" them with energy in a space between two parallel mirrors). 1999: The Space Shuttle launches the Chandra X-ray Observatory—the most sensitive X-ray telescope to date. 2000s: CT X-ray scanners are used to improve baggage-screening security in airports. 2009: Scientists at SLAC National Accelerator Laboratory, Menlo Park, California produce a powerful X-ray laser described as "the world's brightest X-ray source." 2018: Researchers in New Zealand develop a medical scanner that can produce 3D color X rays of the human body. X Rays: What does an X ray test involve? What will it feel like? Are there any risks? The U.S. National Library of Medicine's Medline tells you all you need to know. X Rays: The UK government's NHS website sets out the procedure of having an X ray and describes the benefits and risks (compared to other natural risks we all experience every day). Chandra's Cosmos: Dark Matter, Black Holes, and Other Wonders Revealed by NASA's Premier X-Ray Observatory Hardcover by Wallace H Tucker. Smithsonian, 2017. Explores some of the great discoveries scientists have made using images and data from the Chandra X-Ray Observatory. X-Rays and Extreme Ultraviolet Radiation: Principles and Applications by David Attwood and Anne Sakdinawat. Cambridge University Press, 2016. Covers the basic concepts of high-energy radiation and its applications in lithography, microscopy, astronomy, and lasers. X ray by Nick Veasey. Goodman/Carlton Books, 2013. A collection of intriguing X rays of everyday things, including photos of plants, people, and gadgets. X rays: The First Hundred Years by Alan G. Michette et al (eds). John Wiley & Sons, 1996. A collection of papers published to commemorate 100 years since Röntgen's discovery. 3-D Color X Rays Could Help Spot Deadly Disease Without Surgery by Emily Baumgaertner. The New York Times, July 17, 2018. New X ray medical scanners can produce more realistic color images. X rays Map the 3D Interior of Integrated Circuits by Rachel Courtland. IEEE Spectrum, March 17, 2017. How scientists are using X rays to probe the inner structure of microchips. You Probably Don't Need Dental X Rays Every Year by Austin Frakt. The New York Times, July 25, 2016. Do you really need to have dental X rays so often? Less Is More With Next-Generation Medical X rays by Mark Anderson. IEEE Spectrum, February 27, 2014. A new technique called X-ray phase-contrast imaging (XPCI) promises more comprehensive images with smaller X ray doses.